It’s an unfortunate fact that drivers do not always share the road with motorcyclists. When an accident occurs, motorcyclists are more likely to suffer serious injuries, which makes it important to carry adequate auto insurance. In Massachusetts, you must buy auto insurance for your motorcycle, just as you do for a car, truck or SUV. You are required to buy a minimum level - known as Compulsory Coverage - but you should buy even more to protect yourself and your family. For more than 25 years, the Boston motorcycle accident lawyers at Breakstone, White & Gluck have vigorously pursued compensation for injured motorcyclists. While we hope you are never injured in a motorcycle accident, it pays to have coverage if you need it. Below, we list the types of Compulsory Coverage you must have. We also explain a few important types of Optional Coverage you should have, including Medical Payments, Uninsured Auto, Underinsured Auto and Bodily Injury, as well as a key discount available to motorcyclists in Massachusetts. Personal Injury Protection (PIP) - available for drivers of automobiles, but not for motorcyclists. Insurance companies do not provide Personal Injury Protection (PIP) on motorcycle policies. This is a “no fault” coverage in Massachusetts, meaning it is available to drivers regardless of fault. It pays up to $8,000 in medical bills and lost wages for injured drivers. Since PIP is unavailable to motorcyclists, you should purchase an adequate amount of Medical Payments coverage, an Optional Coverage which will cover medical expenses. We strongly recommend you purchase Medical Payments Coverage. This pays for medical expenses which are not covered by other auto insurance or your health insurance. This will cover you, as well as a passenger in the event of a motorcycle accident. In addition, Medical Payments Coverage can be used to discharge health insurance liens that may be placed on your case by health insurance companies. Without Medical Payments Coverage, if a health insurance lien is placed on your case, you may have to pay the lien out of your settlement. That means you receive less money. Too often, the other driver is found at fault for an accident but has no insurance, even though it is required under Massachusetts law. Other times, drivers do not have an adequate amount to fully compensate the injured motorcyclist. These are major setbacks if you are injured and need compensation for medical bills, lost wages and pain and suffering. If you have adequate Uninsured Auto and Underinsured Coverage, you are in a much better position to recover your damages. You can look to your own auto insurance policy for compensation. If you do make a claim for uninsured or underinsured coverage, it does not affect your policy rates. You can only buy these coverages up to the amount of bodily injury coverage, which is why you should also carry high limits for bodily injury to another person. Bodily Injury Coverage will protect you from a personal injury claim if the tables are turned and you are found responsible for a serious accident. You can purchase up to $500,000 per person per accident. Once you purchase the minimum coverage required, increasing the coverage is not very expensive. We recommend you fully explore these and other Optional Coverage options with your insurance agent each year, as well as any discounts you may qualify to receive. In Massachusetts, motorcyclists can qualify for a 10 percent insurance discount if they complete a beginner or experienced ridership course from a state-approved school. See the full list of Massachusetts Education Ridership Companies across the state. 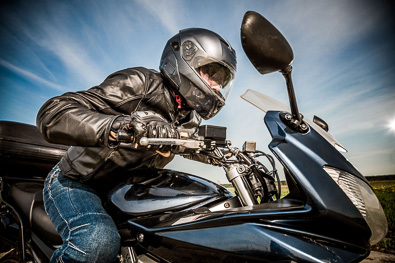 Recovering from a motorcycle accident can be a long, painful and challenging process, but it is easier when motorcyclists have robust insurance coverage to supplement the at-fault driver’s insurance. But even with adequate insurance, you still should hire an attorney to represent your best interests after an accident. With more than 100 years combined experience, attorneys Marc L. Breakstone, David W. White and Ronald E. Gluck have the experience and commitment to obtain results for motorcyclists after an injury. We have obtained several multi-million awards for injured motorcyclists and Massachusetts Lawyers Weekly has reported our settlements as among the top awards in the state. If you are a motorcyclist and have been injured, we offer a free legal consultation. Contact us today at 800-379-1244 or 617-723-7676 or use our contact form.